This is not just a piece of meat. 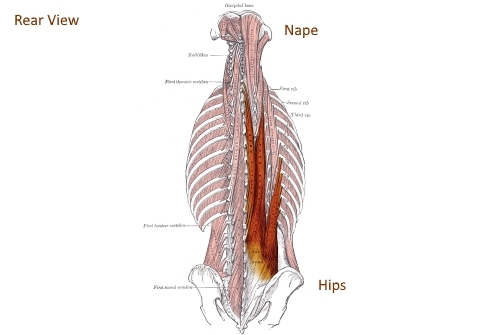 It is a section of human muscular anatomy, shown here to illustrate how tension in areas far away from the hips can lead to lumbosacral and/or hip pain. Highlighted are sections of the erector spinae muscles. Though not evident here, they extend up to the cervical spine (neck). Poor posture can tax the erector spinae; and ladies, this muscle group can be stressed by wearing high-heeled shoes. Tension or trigger points anywhere within this muscle group can affect movement involving the base of the spine (sacrum) and hips. Pain can occur either from tension itself, or from the subsequent hindrance of joint movement or blood circulation. How Does Tension Cause Pain? Tension can directly trigger the pain receptors of the nervous system. Other elicitors of pain, that are the byproduct of tension, may be (1) inflammation due to joint dysfunction, or (2) ischemia—diminished blood flow. Since blood carries oxygen, blood stagnation also reduces local oxygen supply. This leads to anaerobic metabolism (energy production in the absence of oxygen), causing tissue irritation from the acidity of increased hydrogen ions (lowered pH). Whether inflammation or ischemia, it is still the nervous system that sends the pain signal. How Do You Treat the Pain? The Bladder Channel runs through this muscle group. Acupuncture along this channel can restore function and relieve pain from erector spinae strain. No Really, How Do You Treat the Pain? 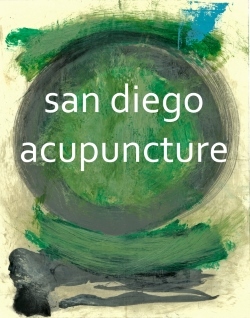 Traditional acupuncture speaks of qi, specifically the movement thereof. To treat pain, we say that we move qi. This is intentionally vague to avoid a myopic approach to treatment, to rather focus on how well the body is integrated along connective tissue planes. That is, to look at the big picture and the body as a whole. To be less vague, but still broad in scope, Chinese medicine has defined major connective tissue planes as acupuncture channels. While these are major networks that organize the body, they affect all the minor and hidden areas because all tissues and organs are entwined by the unifying action of connective tissue. The free movement of qi means that there is an absence of undue tension in the connective tissue. Nerves and blood vessels (and lymphatic vessels) travel within the connective tissue; and the musculo-skeletal system is a structural system made of connective tissue. Therefore, though it is not explicitly stated, to “move qi” is to modulate the nervous system, enhance circulation, and efficiently transfer forces (not Jedi force, but physical force) throughout the body. As stated above, physical pain involves the nervous system and blood circulation. These are viewed as two separate systems in Western physiology. Chinese medicine views them as one system that also includes connective tissue. The health of the system is dependent on connective tissue pliability, i.e. whether qi is free or stagnant. Acupuncture treats pain by restoring pliability. Now, qi becomes less ethereal (and less poetic), but more tangible. This applies not just to the erector spinae but to all areas of the body.